Round 3 of the Isle of Wight Car Club season returned to the unforgiving venue of the Isle of Wight College. The weather forecast was for heavy rain in the afternoon, so competitors were keen to get out and place a good time. After the mandatory walk round the course, many of the 24 drivers who entered on the day could not remember the course and wanted to hold back before committing to their first run. One driver who had no concerns about where to go was Wayne Hole in his class 2 MX5. He was first out off the start line and produced a very quick time in the process. It was nice to see the return of the Lower family who made the trip from the mainland to compete at the event in their class 4 MX5. Not content with producing a quick time, they also astounded the onlookers with their flamboyant driving style. Another welcome return was that of Gerald Wilby who bravely muscled his Austin Healey around the tight unforgiving curbs of the College car park. As the morning progressed the times tumbled and a battle between Dean Masterton, Garry Wetherick and Leon Chessell ensued. These three gentlemen were sharing a Suzuki Cappuccino and each driver was keen to be the fastest. At the beginning of run 5 the rain started falling and any chance of producing a faster lap time fell with it. In the end Leon proved to be the better drive and stood on the 3rd step of the podium, joined by Steve Wells in his newly acquired class 5 Sub zero who took the 2nd step. 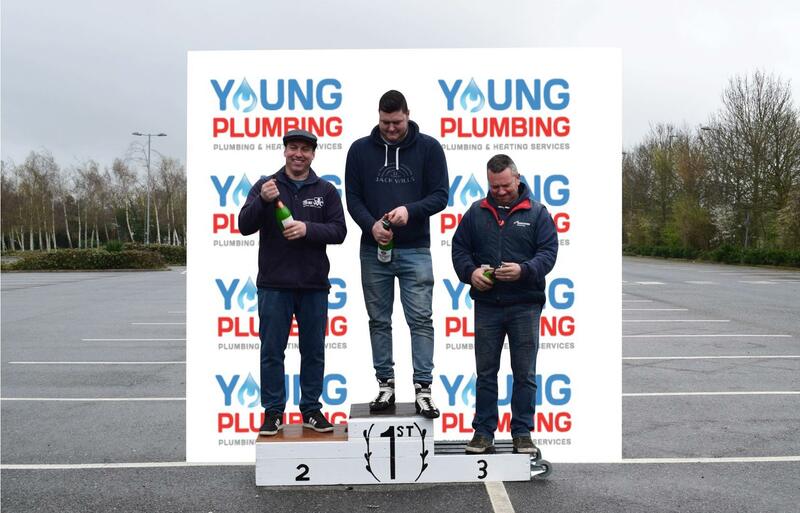 However, Chris Wilson was consistently the fastest around the College all day and claimed the top spot with an astonishing 1 and a half second lead spraying champagne supplied by our podium sponsor Young Plumbing.